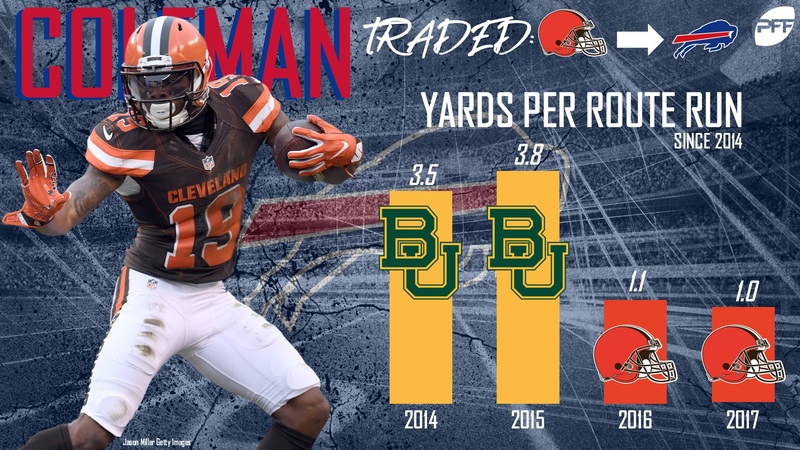 As reported by Adam Schefter last night, the Cleveland Browns have traded former first-round draft pick, WR Corey Coleman to the Buffalo Bills for a seventh-round draft pick in 2020. A standout at Baylor, Coleman has been bothered by injuries since arriving in the NFL, and just couldn’t string together some consistently strong performances. He’s still young enough that he can turn that around though, so it is a move that makes sense for a late-round pick for the Bills. Looking at Coleman’s career so far with PFF’s new and improved Premium Stats 2.0 doesn’t paint a pretty picture, with PFF grades of 61.7 and 60.3 in his first two seasons in the NFL, but when you dig a little deeper, there were flashes there that indicate we shouldn’t give up on him just yet. In 2017, he had two games where he looked much more like the receiver everyone thought he could be coming out of college, with five catches for 53 yards and a touchdown to go along with a 79.3 PFF grade against the Pittsburgh Steelers to open the season, and a 79.8 graded performance where he had five catches for 62 yards and a touchdown against the Green Bay Packers in Week 14. There was also a 73.4 PFF grade in just the second game of his career, a five-catch, 104-yard, two-touchdown performance against the Baltimore Ravens in Week 2 of 2016. The other thing to remember is that Coleman hasn’t exactly been blessed with productive quarterback play in his time in Cleveland. As a rookie, the Browns used multiple different quarterbacks, with just Cody Kessler producing a PFF season grade above 65.0. Somehow, things were even worse in 2017, with then-rookie DeShone Kizer, also now traded off the roster, seeing the bulk of the snaps but producing a PFF grade of just 52.8, and the second-lowest adjusted completion percentage among quarterbacks with at least 200 dropbacks at 65.5 percent. Coleman has his flaws, including a 14.8 percent drop rate that was tied for seventh-worst among wide receivers to see at least 50 targets in 2017, but when you factor in the injuries and instability at the quarterback position, his early struggles aren’t a death sentence for his NFL career just yet. Before writing off Coleman as a bust, consider that the only two players among the Browns wide receivers and tight ends to finish 2017 with a PFF receiving grade of 70.0 or higher were Josh Gordon (76.2) and David Njoku (71.1). Looking at the Bills roster, there’s every chance that Coleman can be a Day 1 starter for the team in 2018. Kelvin Benjamin is the presumed No. 1 wide receiver, and has graded better than Coleman so far in his career, as his 69.0 PFF grade in 2017 was the lowest of his career so far. After Benjamin though, there’s no player who you can say is comfortably better than Coleman, with Andre Holmes and Zay Jones his biggest competition on the outside. Holmes hasn’t seen 30 targets or more in each of the past three seasons, while Jones struggled as a rookie with five drops from 34 catchable targets in the regular season and playoffs. While seeing playing time is a perfectly reasonable explanation for Coleman given his talents and the players he is competing with, the quarterback situation in Buffalo could be just as bad as his past two seasons in Cleveland, which is ironic given that the Browns appear to have found short- and long-term success at the position with Tyrod Taylor and Baker Mayfield. The Bills quarterback battle is between Nathan Peterman, A.J. McCarron and rookie Josh Allen, who have a combined 259 career dropbacks in the regular season and playoffs. McCarron struggled in limited work in 2017, but had some nice moments in 2015, including two starts with a PFF grade above 70.0, before coming undone in the playoffs against the Pittsburgh Steelers. He was at his best throwing in the intermediate range that season, completing 25-of-33 pass attempts for 383 yards with five touchdowns and no interceptions on throws between 10 and 19 yards downfield. Peterman’s performance was rightly criticized after a 24.1 PFF-graded performance where he threw five interceptions from just 14 attempts after being installed as the starter in Week 11, but it’s important for context that we realize he was a fifth-round rookie being thrown in at the deep end against one of the best secondaries in the NFL in the Los Angeles Chargers. As bad as that performance was, and it was catastrophically bad, success should have never been expected there. If we look back at the 2017 preseason, Peterman produced a 76.7 PFF grade that ranked eighth in the NFL among quarterbacks with at least 50 dropbacks. Both his regular season and preseason work comes in the form of a small sample size, so the truth is, at this point we don’t really know how good he is. Allen is the wild card, and after the Bills traded up to draft him with the seventh overall selection in the 2018 NFL Draft, it’s obvious that he is viewed as the future for the team. Just like Peterman and McCarron though, Allen brings with him a lot of uncertainty. His PFF grade of 66.1 in his final season in college is hardly what you want to see from a top draft pick, but his 82.2 grade in 2016 was much better. The key to remember with Allen is that you are likely to get plenty of big plays (he ranked seventh in the draft class in big-time throw percentage in 2016) but also a lot of poor plays too (he ranked 28th in the class at avoiding turnover-worthy plays last season). The bottom line is that Coleman was a playmaker in college, producing a PFF grade of 90.0 in his final season as Baylor in 2015. He displayed elite short-area quickness, making defenders miss with ease and creating big plays both on downfield catches and after the catch on shorter routes. His yards per route run average ranked third in the draft class at 3.8 and was one of the most exciting offensive players in the draft class. There have been concerns about how ready Baylor wide receivers are for the NFL though, and it would be foolish to pretend that Coleman hasn’t looked pretty raw so far in the NFL. Like the Buffalo quarterback situation, Coleman’s future is unknown, but he has enough talent that it’s worth taking a chance for the Bills.